KTMtwins.com KTM Motorcycle and Product News: Johah Street sighting! Jonah stopped by the shop today after seeing the famous Dr. Ting in San Jose about his wrist. 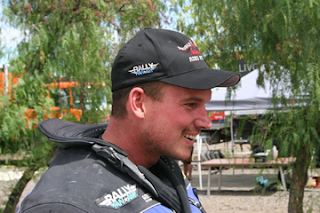 The good news is the injury, though painful enough to end his Dakar effort, was easily fixed. After talking with Jonah he feels good about the injury and is excited about next year and we are too.